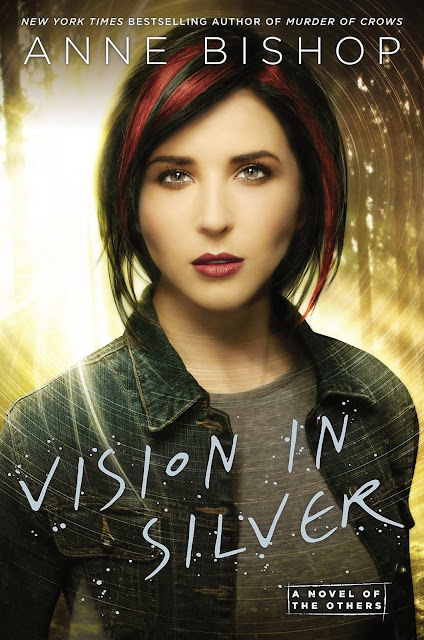 Anne Bishop's The Others series is one of my favorite dark fantasy series, so I jumped on the chance to read and review Vision in Silver. It was everything I wanted, and I was so sad for it to end. I might reread the first two books in the series soon, because I need more Meg, Simon and the rest of the Courtyard. At the end of Murder of Crows tensions between humans and the Others were starting to come to a boil. With Vision in Silver, the tension skyrockets as the Humans First and Last Movement tries to wrestle land/resources away from the Others. We get to see a lot more of the world in the third book, and it just showcased Bishop's awesome worldbuilding talents. The Others visit other settlements, and humans and Others from other cities and towns come to visit Lakeside and the Courtyard. I love how each book just shows how much this is like a ripple in a pool and the further along we get in the stories, we get soooooo much more information and the world and characters continue to expand. I can't wait to find out more information about the even more dangerous Others, that shouldn't be seen or heard because they're so dangerous. Although, it would be really bad for the humans if those Others are seen. There were also several plot threads running through Vision in Silver, which Bishop connected mostly seamlessly at the end. I loved that we got to see more of the free cassandra sangue, and I hope that we get a lot more scenes with them in future books. I also loved all of the police procedural/jewel heist plots. Surprisingly, my least favorite parts were involving Meg. She just seemed kind of blah and whiney. I still love Simon, and I like them together (we really need a kiss! ), but Meg just wasn't as great in this book. But, she also was going through a lot, and that may have been intentional. I think the things I love most about Simon and Meg are that neither of them really understand humanity, themselves or each other so it makes for some hilarious moments. Meg doesn't understand her attraction to Simon and doesn't properly relay her emotions. Simon doesn't understand romance, and doesn't get the human way of relationships. It's a sweet and endearing romance, and a reallyyyyyyy slow-burning one. I love how much the Others show and act like their Other side. I can definitely see Simon's wolf personality and the Crow's love of shinies is awesome. I know Simon is supposed to be a real monster to fear, but I can't help but think he's a mischievous puppy. And, although these are dark fantasies with monsters that eat humans if the humans misbehave (or even if they don't), Bishop throws enough humor in that it's not (too) depressing or scary. I also giggle about the sayings the Others are confused about, or anything that humans do that the Others think is stupid, crazy or silly. But, it's also a little profound, because the Others can see how terrible humans treat each other, and how illogical humans can be in their hatred, fear and bias. Basically Bishop took everything I loved about the series and expounded upon it. I wouldn’t change a thing (except to make it neverending, but that's not possible). I am eagerly anticipating the next installment. If you like dark fantasy with great worldbuilding, you should definitely start this series! To satisfy FTC guidelines, I am disclosing that I each received a copy of the novel from the publisher via NetGalley in exchange for an unbiased review. Meg did seem a little more helpless/damsel-in-distress in this book (which is kind of strange considering how helpless she was at the start), but I'm definitely looking forward to the next book. Great review! Great review, hope i can read it soon, All books writing by Anne Bishop are amazing.